In such snowstorms, firefighters can waste precious minutes finding and digging out hydrants. A city employee told the CFA team that the planning department had a list of street addresses for Boston’s 13,000 hydrants. “We figured, ‘Surely someone on the block with a shovel would volunteer if they knew where to look,'” says Erik Michaels-Ober, one of the CFA coders. So they got out their laptops. 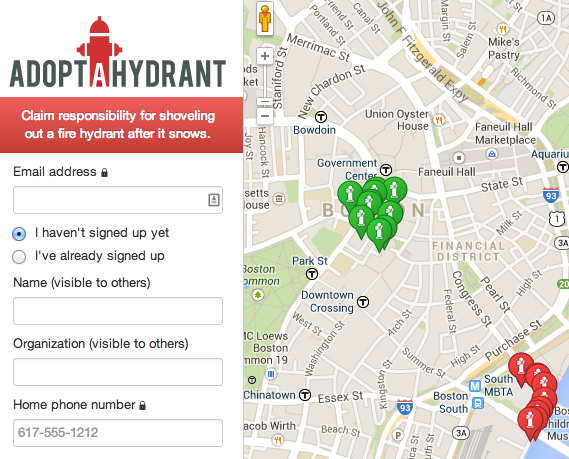 Now, Boston has adoptahydrant.org, a simple website that lets residents “adopt” hydrants across the city. The site displays a map of little hydrant icons. Green ones have been claimed by someone willing to dig them out after a storm, red ones are still available—500 hydrants were adopted last winter. Maybe that doesn’t seem like a lot, but consider what the city pays to keep it running: $9 a month in hosting costs. “I figured that even if it only led to a few fire hydrants being shoveled out, that could be the difference between life or death in a fire, so it was worth doing,” Michaels-Ober says. And because the CFA team open-sourced the code, meaning they made it freely available for anyone to copy and modify, other cities can adapt it for practically pennies. It has been deployed in Providence, Anchorage, and Chicago. A Honolulu city employee heard about Adopt-a-Hydrant after cutbacks slashed his budget, and now Honolulu has Adopt-a-Siren, where volunteers can sign up to check for dead batteries in tsunami sirens across the city. In Oakland, it’s Adopt-a-Drain. Sounds great, right? These simple software solutions could save lives, and they were cheap and quick to build. Unfortunately, most cities will never get a CFA team, and most can’t afford to keep a stable of sophisticated programmers in their employ, either. For that matter, neither can many software companies in Silicon Valley; the talent wars have gotten so bad that even brand-name tech firms have been forced to offer employees a bonus of upwards of $10,000 if they help recruit an engineer. In fact, even as the Department of Labor predicts the nation will add 1.2 million new computer-science-related jobs by 2022, we’re graduating proportionately fewer computer science majors than we did in the 1980s, and the number of students signing up for Advanced Placement computer science has flatlined. So you might be forgiven for thinking that learning code is a short, breezy ride to a lush startup job with a foosball table and free kombucha, especially given all the hype about billion-dollar companies launched by self-taught wunderkinds (with nary a mention of the private tutors and coding camps that helped some of them get there). The truth is, code—if what we’re talking about is the chops you’d need to qualify for a programmer job—is hard, and lots of people would find those jobs tedious and boring. So what is computational thinking? If you’ve ever improvised dinner, pat yourself on the back: You’ve engaged in some light CT. There are those who open the pantry to find a dusty bag of legumes and some sad-looking onions and think, “Lentil soup!” and those who think, “Chinese takeout.” A practiced home cook can mentally sketch the path from raw ingredients to a hot meal, imagining how to substitute, divide, merge, apply external processes (heat, stirring), and so on until she achieves her end. Where the rest of us see a dead end, she sees the potential for something new. Like a good algorithm, a good recipe follows some basic principles. Ingredients are listed first, so you can collect them before you start, and there’s some logic in the way they are listed: olive oil before cumin because it goes in the pan first. Steps are presented in order, not a random jumble, with staggered tasks so that you’re chopping veggies while waiting for water to boil. A good recipe spells out precisely what size of dice or temperature you’re aiming for. It tells you to look for signs that things are working correctly at each stage—the custard should coat the back of a spoon. Opportunities for customization are marked—use twice the milk for a creamier texture—but if any ingredients are absolutely crucial, the recipe makes sure you know it. If you need to do something over and over—add four eggs, one at a time, beating after each—those tasks are boiled down to one simple instruction. Much like cooking, computational thinking begins with a feat of imagination, the ability to envision how digitized information—ticket sales, customer addresses, the temperature in your fridge, the sequence of events to start a car engine, anything that can be sorted, counted, or tracked—could be combined and changed into something new by applying various computational techniques. From there, it’s all about “decomposing” big tasks into a logical series of smaller steps, just like a recipe. Those techniques include a lot of testing along the way to make sure things are working. The culinary principle of mise en place is akin to the computational principle of sorting: organize your data first, and you’ll cut down on search time later. Abstraction is like the concept of “mother sauces” in French cooking (béchamel, tomato, hollandaise), building blocks to develop and reuse in hundreds of dishes. There’s iteration: running a process over and over until you get a desired result. The principle of parallel processing makes use of all available downtime (think: making the salad while the roast is cooking). Like a good recipe, good software is really clear about what you can tweak and what you can’t. It’s explicit. Computers don’t get nuance; they need everything spelled out for them. Put another way: Not every cook is a David Chang, not every writer is a Jane Austen, and not every computational thinker is a Guido van Rossum, the inventor of the influential Python programming language. But just as knowing how to scramble an egg or write an email makes life easier, so too will a grasp of computational thinking. Yet the “learn to code!” camp may have set people on the uphill path of mastering C++ syntax instead of encouraging all of us to think a little more computationally. The happy truth is, if you get the fundamentals about how computers think, and how humans can talk to them in a language the machines understand, you can imagine a project that a computer could do, and discuss it in a way that will make sense to an actual programmer. Because as programmers will tell you, the building part is often not the hardest part: It’s figuring out what to build. “Unless you can think about the ways computers can solve problems, you can’t even know how to ask the questions that need to be answered,” says Annette Vee, a University of Pittsburgh professor who studies the spread of computer science literacy. Or take Adopt-a-Hydrant. Under the hood, it isn’t a terribly sophisticated piece of software. What’s ingenious is simply that someone knew enough to say: Here’s a database of hydrant locations, here is a universe of people willing to help, let’s match them up. The computational approach is rooted in seeing the world as a series of puzzles, ones you can break down into smaller chunks and solve bit by bit through logic and deductive reasoning. That’s why Jeannette Wing, a VP of research at Microsoft who popularized the term “computational thinking,” says it’s a shame to think CT is just for programmers. “Computational thinking involves solving problems, designing systems, and understanding human behavior,” she writes in a publication of the Association for Computing Machinery. Those are handy skills for everybody, not just computer scientists. “Code literate.” Sounds nice, but what does it mean? And where does literacy end and fluency begin? The best way to think about that is to look to the history of literacy itself. Fast forward to 19th-century America, and it’d be impossible to walk down a street without being bombarded with written information, from newspapers to street signs to store displays; in the homes of everyday people, personal letters and account ledgers could be found. “The technology of writing became infrastructural,” Vee writes in her paper “Understanding Computer Programming As a Literacy.” “Those who could not read text began to be recast as ‘illiterate’ and power began to shift towards those who could.” Teaching children how to read became a civic and moral imperative. Literacy rates soared over the next century, fostered through religious campaigns, the nascent public school system, and the at-home labor of many mothers. Of course, not everyone was invited in immediately: Illiteracy among women, slaves, and people of color was often outright encouraged, sometimes even legally mandated. But today, while only some consider themselves to be “writers,” practically everybody reads and writes every day. It’s hard to imagine there was ever widespread resistance to universal literacy. Once the UNIVAC was unveiled, research institutions and the private sector began clamoring for mainframes of their own. The scribes of the computer age, the early programmers who had worked on the first large-scale computing projects for the government during the war, took jobs at places like Bell Labs, the airline industry, banks, and research universities. “The spread of the texts from the central government to the provinces is echoed in the way that the programmers who cut their teeth on major government-funded software projects then circulated out into smaller industries, disseminating their knowledge of code writing further,” Vee writes. 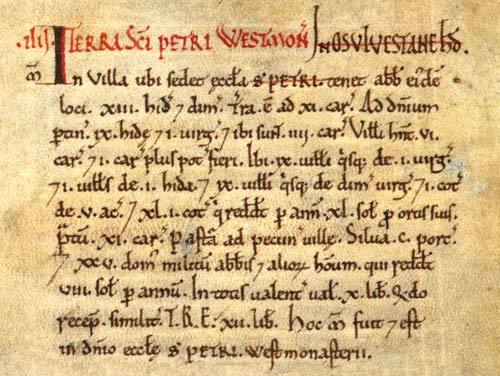 Just as England had gone from oral tradition to written record after the Domesday Book, the United States in the 1960s and ’70s shifted from written to computational record. The 1980s made computers personal, and today it’s impossible not to engage in conversations powered by code, albeit code that’s hidden beneath the interfaces of our devices. But therein lies a new problem: The easy interface creates confusion around what it means to be “computer literate.” Interacting with an app is very different from making or tweaking or understanding one, and opportunities to do the latter remain the province of a specialized elite. In many ways, we’re still in the “scribal stage” of the computer age. But the tricky thing about literacy, Vee says, is that it begets more literacy. It happened with writing: At first, laypeople could get by signing their names with an “X.” But the more people used reading and writing, the more was required of them. The most exciting advances in most scientific and technical fields already involve big datasets, powerful algorithms, and people who know how to work with both. But that’s increasingly true in almost any profession. English literature and computer science researchers fed Agatha Christie’s oeuvre into a computer, ran a textual-analysis program, and discovered that her vocabulary shrank significantly in her final books. They drew from the work of brain researchers and put forth a new hypothesis: Christie suffered from Alzheimer’s. “More and more, no matter what you’re interested in, being computationally savvy will allow you to do a better job,” says Jan Cuny, a leading CS researcher at the National Science Foundation (NSF). It may be hard to swallow the idea that coding could ever be an everyday activity on par with reading and writing in part because it looks so foreign (what’s with all the semicolons and carets)? But remember that it took hundreds of years to settle on the writing conventions we take for granted today: Early spellings of words—Whan that Aprille with his shoures soote—can seem as foreign to modern readers as today’s code snippets do to nonprogrammers. Compared to the thousands of years writing has had to go from notched sticks to glossy magazines, digital technology has, in 60 years, evolved exponentially faster. Our elementary-school language arts teachers didn’t drill the alphabet into our brains anticipating Facebook or WhatsApp or any of the new ways we now interact with written material. Similarly, exposing today’s third-graders to a dose of code may mean that at 30 they retain enough to ask the right questions of a programmer, working in a language they’ve never seen on a project they could never have imagined. One day last year, Neil Fraser, a young software engineer at Google, showed up unannounced at a primary school in the coastal Vietnamese city of Da Nang. Did the school have computer classes, he wanted to know, and could he sit in? A school official glanced at Fraser’s Google business card and led him into a classroom of fifth-graders paired up at PCs while a teacher looked on. What Fraser saw on their screens came as a bit of a shock. The fifth-graders in Da Nang were doing exercises in Logo, a simple program developed at MIT in the 1970s to introduce children to programming. A turtle-shaped avatar blinked on their screens and the kids fed it simple commands in Logo‘s language, making it move around, leaving a colored trail behind. Stars, hexagons, and ovals bloomed on the monitors. Fraser, who learned Logo when the program was briefly popular in American elementary schools, recognized the exercise. It was a lesson in loops, a bedrock programming concept in which you tell the machine to do the same thing over and over again, until you get a desired result. “A quick comparison with the United States is in order,” Fraser wrote later in a blog post. At Galileo Academy, San Francisco’s magnet school for science and technology, he’d found juniors in a computer science class struggling with the concept of loops. The fifth-graders in Da Nang had outpaced upperclassmen at one of the Bay Area’s most tech-savvy high schools. Early code education isn’t just happening in Vietnamese schools. Estonia, the birthplace of Skype, rolled out a countrywide programming-centric curriculum for students as young as six in 2012. In September, the United Kingdom will launch a mandatory computing syllabus for all students ages 5 to 16. “Our kids are competing with kids from countries that have made computer science education a No. 1 priority,” says Chris Stephenson, the former head of the Computer Science Teachers Association (CSTA). Unlike countries with federally mandated curricula, in the United States computer lesson plans can vary widely between states and even between schools in the same district. “It’s almost like you have to go one school at a time,” Stephenson says. 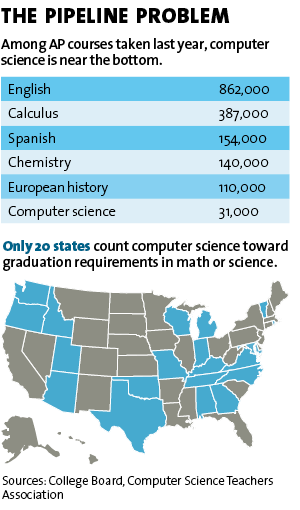 In fact, currently only 20 states and Washington, DC, allow computer science to count toward core graduation requirements in math or science, and not one requires students to take a computer science course to graduate. Nor do the new Common Core standards, a push to make K-12 curricula more uniform across states, include computer science requirements. It’s no surprise, then, that the AP computer science course is among the College Board’s least popular offerings; last year, almost four times more students tested in geography (114,000) than computer science (31,000). And most kids don’t even get to make that choice; only 17 percent of US high schools that have advanced placement courses do so in CS. It was 20 percent in 2005. For those who do take an AP computer science class—a yearlong course in Java, which is sort of like teaching cooking by showing how to assemble a KitchenAid—it won’t count toward core graduation requirements in most states. What’s more, many counselors see AP CS as a potential GPA ding, and urge students to load up on known quantities like AP English or US history. “High school kids are overloaded already,” says Joanna Goode, a leading researcher at the University of Oregon’s education department, and making time for courses that don’t count toward anything is a hard sell. In any case, it’s hard to find anyone to teach these classes. Unlike fields such as English and chemistry, there isn’t a standard path for aspiring CS teachers in grad school or continuing education programs. And thanks to wildly inconsistent certification rules between states, certified CS teachers can get stuck teaching math or library sciences if they move. Meanwhile, software whizzes often find the lure of the startup salary much stronger than the call of the classroom, and anyone who tires of Silicon Valley might find that its “move fast and break things” mantra doesn’t transfer neatly to pedagogy. And while many kids have mad skills in movie editing or Photoshopping, such talents can lull parents into thinking they’re learning real computing. “We teach our kids how to be consumers of technology, not creators of technology,” notes the NSF’s Cuny. 2 The kids did quickly learn to hack their iPads, so there’s some hope for actual inventiveness. Sure, some schools are woefully behind on the hardware equation, but according to a 2010 federal study, only 3 percent of teachers nationwide lacked daily access to a computer in their classroom, and the nationwide ratio of students to school computers was a little more than 5-to-1. As to whether kids have computers at home—that doesn’t seem to make much difference in overall performance, either. A study from the National Bureau of Economic Research reviewed the grades, test scores, homework, and attendance of California 6th- to 10th-graders who were randomly given computers to use at home for the first time. A year later, the study found, nothing happened. Test scores, grades, disciplinary actions, time spent on homework: None of it went up or down—except the kids did log a lot more time playing games. We’re still in the “scribal stage” of the computer age, where skills are in the hands of an elite. This lesson—which by the end of the day clicked for most in the class—might seem like most people’s image of CS, but the course these teachers are learning to teach couldn’t look more different from classic AP computer science. Much of what’s taught in ECS is about the why of computer science, not just the how. There are discussions and writing assignments on everything from personal privacy in the age of Big Data to the ethics of robot labor to how data analysis could help curb problems like school bullying. Instead of rote Java learning, it offers lots of logic games and puzzles that put the focus on computing, not computers. In fact, students hardly touch a computer for the first 12 weeks. 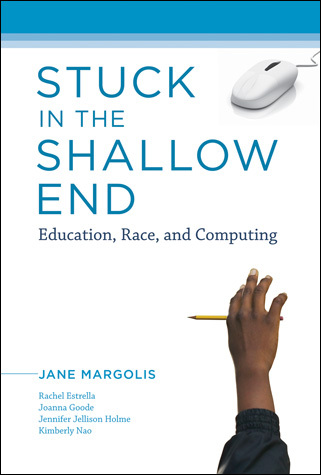 “Our curriculum doesn’t lead with programming or code,” says Jane Margolis, a senior researcher at UCLA who helped design the ECS curriculum and whose book Stuck in the Shallow End: Education, Race, and Computing provides much of the theory behind the lesson plans. “There are so many stereotypes associated with coding, and often it doesn’t give the broader picture of what the field is about. The research shows you want to contextualize, show how computer science is relevant to their lives.” ECS lessons ask students to imagine how they’d make use of various algorithms as a chef, or a carpenter, or a teacher, how they could analyze their own snack habits to eat better, and how their city council could use data to create cleaner, safer streets. The ECS curriculum is now offered to 2,400 students at 31 Los Angeles public high schools and a smattering of schools in other cities, notably Chicago and Washington, DC. Before writing it, Margolis and fellow researchers spent three years visiting schools across the Los Angeles area—overcrowded urban ones and plush suburban ones—to understand why few girls and students of color were taking computer science. At a tony school in West LA that the researchers dubbed “Canyon Charter High,” they noticed students of color traveling long distances to get to school, meaning they couldn’t stick around for techie extracurriculars or to simply hang out with like-minded students. Research shows that girls tend to pull away from STEM subjects—including computer science—around middle school, while rates of boys in these classes stay steady. Fortunately, says Margolis, there’s evidence that tweaking the way computer science is introduced can make a difference. A 2009 study tested various messages about computer science with college-bound teens. It found that explaining how programming skills can be used to “do good”—connect with one’s community, make a difference on big social problems like pollution and health care—reverberated strongly with girls. Far less successful were messages about getting a good job or being “in the driver’s seat” of technological innovation—i.e., the dominant cultural narratives about why anyone would learn to code. Merino has spent the last four years teaching kids of color growing up in inner cities to imagine what they could do with programming—not as a replacement for, but as part of their dreams of growing up to be doctors or painters or social workers. But Merino’s partner’s gentle ribbings about how they’d ever start a family on a teacher’s salary eventually became less gentle. She just took a job as director of professional development at CodeHS, an educational startup in San Francisco. There’s the talent squeeze, for one thing. Going by the number of computer science majors graduating each year, we’re producing less than half of the talent needed to fill the Labor Department’s job projections. 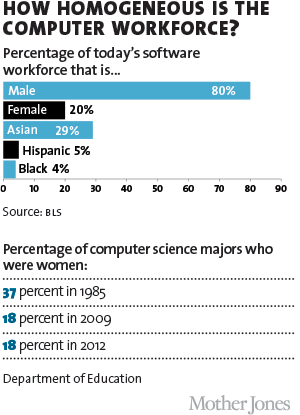 Women currently make up 20 percent of the software workforce, blacks and Latinos around 5 percent each. Getting more of them in the computing pipeline is simply good business sense. It would also create a future for computing that more accurately reflects its past. A female mathematician named Ada Lovelace wrote the first algorithm ever intended to be executed on a machine in 1843. The term “programmer” was used during World War II to describe the women who worked on the world’s first large-scale electronic computer, the ENIAC machine, which used calculus to come up with tables to improve artillery accuracy 3. In 1949, Rear Adm. Grace Hopper helped develop the UNIVAC, the first general-purpose computer, a.k.a. a mainframe, and in 1959 her work led to the development of COBOL, the first programming language written for commercial use. 3 Six “ENIAC girls” did most of the programming, but until recently their work was all but forgotten. Male engineers worked on ENIAC’s hardware, reflecting that until the 1950s, coding was considered clerical—even though it always involved higher math and applied logic. 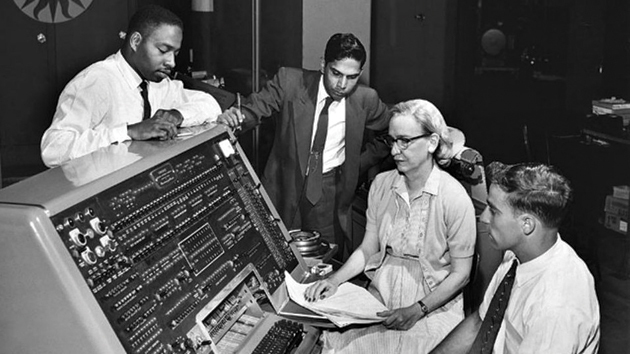 It was recast as a masculine pursuit as projects like Grace Hopper’s UNIVAC demonstrated its promise. Fortunately, there’s evidence that girls exposed to very basic programming concepts early in life are more likely to major in computer science in college. That’s why approaches like Margolis’ ECS course, steeped in research on how to get and keep girls and other underrepresented minorities in computer science class, as well as groups like Black Girls Code, which offers affordable code boot camps to school-age girls in places like Detroit and Memphis, may prove appealing to the industry at large. We make kids learn about biology, literature, history, and geometry with the promise that navigating the wider world will be easier for their efforts. It’ll be harder and harder not to include computing on that list. Decisions made by a narrow demographic of technocrat elites are already shaping their lives, from privacy and social currency, to career choices and how they spend their free time. Margolis’ program and others like it are a good start toward spreading computational literacy, but they need a tremendous amount of help to scale up to the point where it’s not such a notable loss when a teacher like Kim Merino leaves the profession. What’s needed to make that happen is for people who may never learn a lick of code themselves to help shape the tech revolution the old-fashioned way, through educational reform and funding for schools and volunteer literacy crusades. Otherwise, we’re all doomed—well, most of us, anyway—to be stuck in the Dark Ages.